The on-going transition to more sustainable energy production methods means that we are moving away from a monolithic, centrally controlled model to one in which both production and consumption are progressively decentralised and localised. This in turn gives rise to complex interacting networks. ICT and mathematics will be instrumental in making these networks more efficient and resilient. This article highlights two research areas that we expect will play an important role in these developments. Dulman, S.O, & Pauwels, E.J.E.M. (2014). 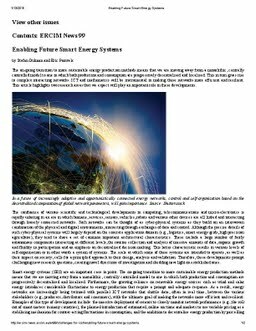 Enabling Future Smart Energy Systems. ERCIM News, 99.